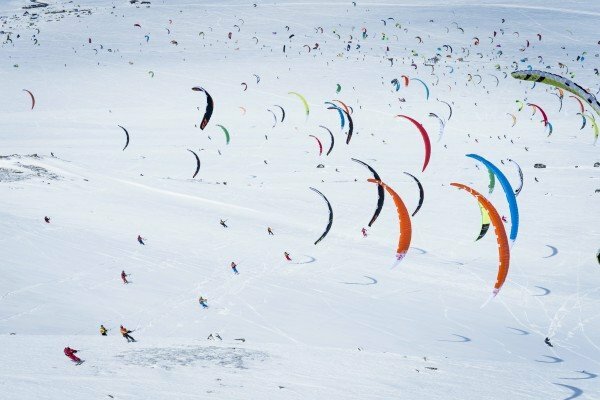 Now here’s a sight you don’t see everyday: 350 kites, strung out across a snowy plain, pulling racers on skis and snowboards in a 100 kilometer endurance race. The sport is called snowkite and really it’s a perfectly logical combination of snowboarding and skiing with kitesurfing. This year’s Red Bull Ragnarok in Norway was the sixth of its kind, drawing participants this year from 30 different countries for the largest contest yet. The grueling conditions and overall course length proved challenging even for the world’s best kite surfers who came to test their meddle on snow. ”I love it, even though I can’t feel my nose,” said one participant. For many it was an accomplishment just to finish the race. For more visit Red Bull and watch the video below.